Not that long to go now, till the opening of “Boy on a Bed”. I’m the set designer of the show. I’m currently doing a Foundation Degree in Film & TV Production, so with an interest in Production Design I was having a look online for some work experience. A friend told me about this web page “stage jobs pro”, where you can find a wide range of different work placements. That’s where I saw this role for a set designer and from there got in touch with Gayle (Organised Chaos Productions). As the set designer I have been collaborating with the Director, in this case Alastair to create “The World of the Play”, by turning the design into a stage reality. Our aim is to fully immerse the viewer in the production. I’ve learnt a lot throughout the past six weeks, we have changed the set design quite a few times but with there not being scenes and all the dialogue being continuous and based in four different locations, when sketching plans and creating models for the set design we have had to be aware of all that. The final set design we have created, is quite simple, (using minimalistic props) but it really works well for the story behind “Boy On A Bed”. Overall it’s been an enjoyable experience. 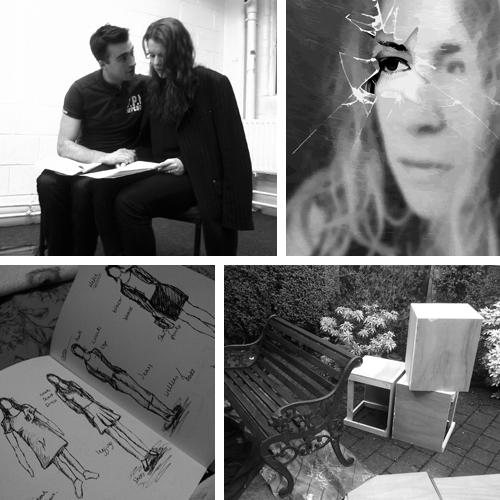 The actors are all progressing really well, throughout the weeks of rehearsals. It will be a great play to watch, there will be love, laughter, a bit of betrayal, but overall it will be an interesting play to come and see. This entry was posted in Introducing, Production: Boy On A Bed, Productions, Set Designer and tagged boy on a bed, jessy cornips, new writing, organised chaos productions, the lowry, theatre on May 8, 2014 by organisedchaosproductions.